Debates between the Ukrainian presidential candidates at the Olympiyskiy National Sports Complex will begin at 14:00 Kyiv time on April 14, President Petro Poroshenko's campaign staff said. 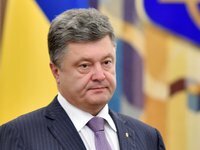 "Poroshenko [...] will appear at the Olympiyskiy National Sports Complex at 14:00 Kyiv time on April 14 for debates with [presidential candidate] Volodymyr Zelensky, and I repeat my invitation to Zelensky once again not to fear or evade debates, to display courage and political will and appear a week before the elections," spokesperson for Poroshenko's campaign staff Oleh Medvedev said at a news briefing in Kyiv on Wednesday. Earlier on Wednesday, the Olympiyskiy National Sports Complex said it had received requests from Poroshenko about holding debates on April 14 and 19, 2019 and from Zelensky on April 19, 2019.